High-Bias or Type-II tapes offer a step up in sound quality. For short lengths check the Cobalt tape category. For BASF chrome we have only 120 minute tape stock. High-bias tapes are made with several different formulations of metals. The first formulation was the classic chromium dioxide (chrome) from BASF. TDK offered a cobalt tape known as SA (Super Avilyn) with a warmer sound. BASF then started mixing cobalt into their chrome tapes. Maxell had the XL tapes made with "black magnetite". 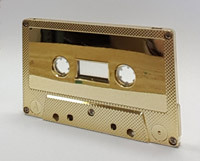 To use high-bias tapes you either need a bias switch on your tape recorder, or you must use chrome-notch cassette shells if you do not have a bias selector. Tapes longer than 100 minutes have a very thin base and are easily damaged, so they are intended only for special purposes and well-maintained machines. We have a small amount of C-110 and C-120 Emtec tape remaining. When calculating your tape length, add 7 to 10 seconds at each end, plus up to 2% in case your machines are off speed. If your program is exactly 30 minutes per side, you could ask us for tapes of 31:00 per side (or C-62s). We also offer audio cassette duplication. Consult our online price calculator. 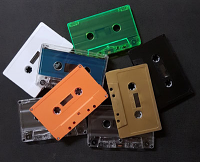 Order high bias Chrome tapes in colored cassettes. The price is for 1 piece, so click to view quantity pricing.